I was sharing pictures of my dad with Dr.Emery today & she immediately wanted the world (at least our Sugar Fix world!) to know about him! She’s heard me talk on and on about the man that I consider my “John Wayne”. My dad’s name is Donald Goodhart and he proudly served in the United States Army 1966-1969. My dad fought in Vietnam from January 1967- January 1968. This year marks the 50th Anniversary of the start of the war. Every year on Veteran’s Day I make sure to call my daddy to thank him for his service and for protecting the freedom I so dearly love. I make sure my children call him individually to do the same. My sister is a 1st grade teacher in Chardon, Ohio & invites our daddy to come to her classroom to speak to her students. The picture with this post is from today’s talk. 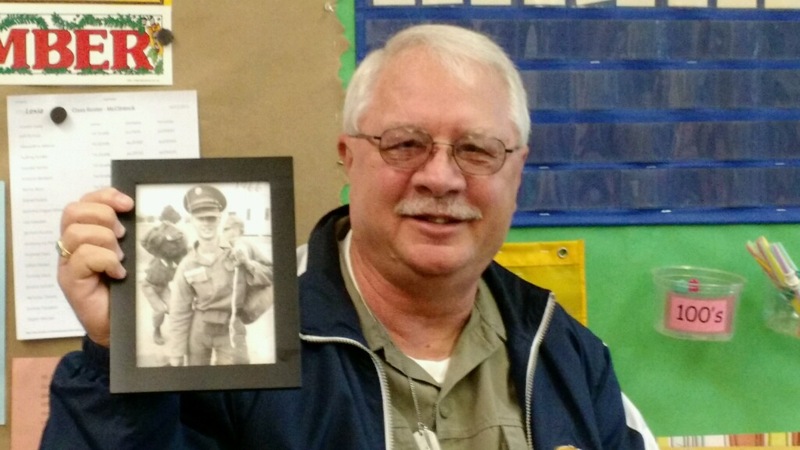 My dad is holding a picture (a very handsome one, I might add) of himself as a young soldier. Today, my dad is considered 100% disabled by the US Military due to his exposure to Agent Orange. For obvious reasons, I’m so thankful he did not lose his life in Vietnam; but he does suffer on a daily basis and has for 27 years because of his time spent in Vietnam. Many people don’t know this about my dad- he is a proud man is incredibly proud to have served for all of us. He is not alone, as there are countless men and women who have done the same & continue to do so for us. Thank you Dr.Emery for giving me the opportunity to share with everyone the man that I consider to be a true American hero. Oh the truth behind all of these words!!!! Our dad is such an inspiration to all who are fortunate enough to know him! Thank you for sharing this with all!!!! Amazing story and beautiful post! Can’t wait to meet him in person! ??? ?